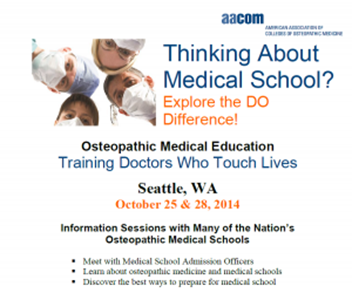 Medical schools recruiting on UW campus (and in downtown Seattle) next week! Open to CC students. The UW UAA pre-health advising team is pleased to announce two medical school recruiting events sponsored by the Student Osteopathic Medical Association and the American Association of Colleges of Osteopathic Medicine (AACOM). 2. Meet the Med School Admissions Officers, co-sponsored by AACOM, SOMA, and the UW pre-health advising team.